Nino Parker wants the city to pay homeless residents to clean and maintain the parks and streets where they live. Nino Parker organized "green teams" to pick up trash around homeless camps. It's almost 1 a.m. on Wednesday, June 20, and the Oakland city clerk has finally called Nino Parker's name. Parker, a 64-year-old with long wizend dreadlocks and a goatee, has sat through the city council's grueling eight-and-a-half-hour meeting to weigh in on Oakland's latest budget adjustments, and to ask for support. He gets up to the microphone and poses a question to those who are still left in the early hours of the morning. "I'd like to start off by asking everyone in here that is homeless and Black to raise your hand," he says. Besides Parker, only one other person in the chambers raises their hand. "I hear a lot of people asking for money for dogs and pools and such," he says, referring to previous public speakers who requested more money in the city budget for animal shelters and recreation centers. Parker then launches into why he's there. He's homeless, yet he contributes to the community by doing work that's unpaid. He wants the city to pay homeless residents a stipend to clean and maintain the city parks and streets where they live. And he wants the rest of society to acknowledge the work that the homeless do to keep public spaces vibrant. Paying the homeless isn't a new idea. Over the years, activists have requested that the city compensate campers who clean city streets. Instead, the city sends public works crews to do it. The city also has expensive contracts with nonprofits that provide services to the homeless, including the city's two sanctioned Tuff Shed camps. Parker thinks that there would be a lot more progress in helping the homeless if the city simply tried working with camp residents to clean and maintain the places where they live. In fact, some homeless people have already organized crews in their camps to address littering and sanitation problems. Parker, who lives near Lake Merritt, is on the cutting edge of this initiative. His "green teams" already pick up trash around five camps at Mosswood Park, Madison Park, Lake Merritt's southern shoreline, and Snow Park. Recently, they've also started cleaning up around Union Point Park in Jingletown. "I'm sick of seeing homeless money go to office cubicles," Parker said in a recent interview, referring to the fact that Oakland pays nonprofits for homeless services, including evicting homeless camps and carrying out other operations that are sometimes harmful to unsheltered residents. Parker's green teams project "was started by the homeless, for the homeless," he said. One of his first accomplishments was convincing Oakland parks employees to provide a regular trash pickup at Lake Merritt near the estuary channel. Because he'd struck up a relationship with parks department workers who regularly clean and maintain the landscaping near the Kaiser auditorium, Parker was able to suggest that the city coordinate its cleanup with camp residents. Now, a garbage truck shows up regularly to allow homeless people to dispose of garbage, some of which they generate, but a lot of which is also from sheltered Oakland residents who party at the lake and leave behind food scraps, bottles, and other trash. About half a mile away at Snow Park, Parker and several of the camp's residents uncovered an old paved pathway lined with decorative rocks under towering eucalyptus trees. For years, the path was buried under about a foot of garbage, dirt, and debris. Today, the area looks well-kept and about half a dozen people live in tents on the grass nearby. Residents of the camp told the Express that the project is empowering and gives them a sense of belonging and responsibility, combatting the marginalization and exclusion that the homeless are subjected to. "We're maintaining landscaping," Parker said, emphasizing that the homeless green teams aren't just cleaning up litter, but they can also repair infrastructure. He said he wants white-collar workers in the office towers surrounding Snow Park to simply recognize and respect the people who live in the park. "When you clean up your area, you stop people from looking down on you as dirty or unsightly," he said, adding that this can lead to the possibility of the homeless being viewed as equals, worthy of respect. At first, the homeless green teams were entirely on their own to obtain tools. In one instance, Parker gathered bottles and cans littering city parks and took them to a recycling center. With the money he earned, Parker purchased shovels and rakes and other tools from Home Depot and distributed them at camps. More recently, he figured out how to use the city's adopt-a-street program. Traditionally, homeowners and businesses in more affluent neighborhoods take advantage of the program to clean up sidewalks and medians. Parker, on the other hand, has gotten point people who live in homeless camps to fill out the program's paperwork, and he delivers tools and supervises their work. It's a big help because, among other things, the city has an inventory of trigger-grip trash grabbers that allow people to safely pick up "sharps" — broken glass, needles, etc. — without using their hands. Another thing Parker is trying to help homeless camps obtain are trash cans with lids. It might sound overly simple, but the ability to dispose of garbage, especially food scraps, in a place where rodents and other vermin can't get to them can dramatically change the conditions of a camp. Too many camps are infested with rats because there's nowhere to easily dispose of waste, and the city doesn't pick up garbage frequently enough. Throughout all of this, Parker said it's impossible to ignore that the majority of Oakland's homeless residents are Black. According to the county's most recent homeless count, 68 percent of Oakland's homeless are Black. Parker characterized the city's homelessness crisis as a matter of racial justice, and said the city's response so far has been inadequate. In many ways, the city's homeless camps have been set up to fail, he added. Trash is allowed to pile up from both the camp residents and from illegal dumping, all because the homeless don't have access to trash removal services. To address this, the city often conducts a "clean and clear," whereby residents are made to temporarily pick up and move their belongings and tents and structures. But some residents aren't around during these events and, as a result, they can lose their property. "That's just as traumatic for the camp residents," said Talya Husbands-Hankin, an organizer with the Homeless Advocacy Working Group, which came together last year to put pressure on the city to provide more resources to homeless residents. She said the green teams sometimes assist residents whose camps are being clean-and-cleared so that it's less stressful and they don't lose belongings. "People think the homeless can't take care of themselves," said Parker, "but we can. What we're trying to do isn't permanent. The goal is to get out of here, to eventually get housing, but as long as we are here we have to live in a decent community." 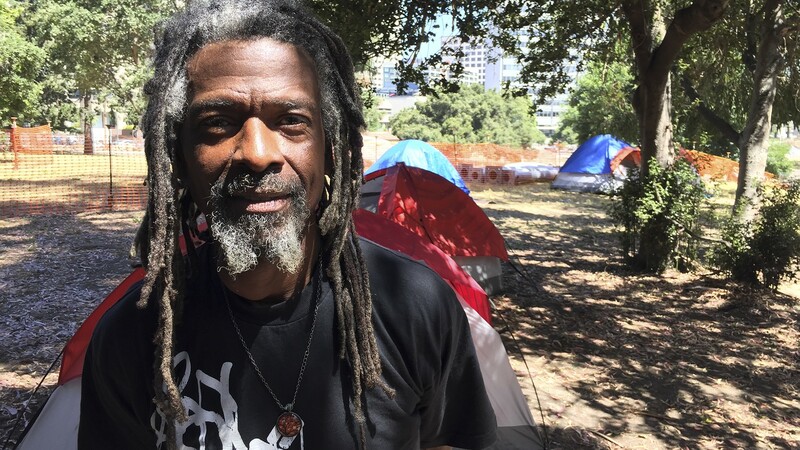 As homeless camps have grown around Lake Merritt, some neighborhood organizations and advocacy groups have put pressure on the city to evict them. "There's been some grousing about the homeless camps," said Naomi Schiff of the Measure DD Coalition. But Schiff helped organize a meeting between Parker and some of these groups, where Parker explained how the self-organized homeless green teams can actually clean up and improve Lake Merritt. Afterward, a coalition of activists, including former city councilmember Pat Kernighan, Children's Fairyland CEO C.J. Hirschfield, and the Lake Merritt Institute, sent a letter of support to the city council and mayor asking, among other things, that Oakland formalize support for Parker's green teams project. In response, the city council agreed last week to allocate $85,000 toward a pilot program that will hire homeless residents to clean the city. Parker hopes to organize more camps so that they're eligible to receive some of this compensation for the work they're doing.